Growing up in Virginia, astronomy was one of my things. Thanks to my high school planetarium, I can identify most of the constellations and easily pick out the planets. (“Planet” means “wanderer” in Greek. Unlike stars, that remain fixed, planets wander through the night sky. Once you know the constellations of the zodiac, spotting planets becomes easy. They’re the star-like things that are out of place.) Then I moved to Seattle, the cloudiest major city in the US. That pretty much stopped my backyard astronomy, but still I hope to pass my love of the night sky on to my kids. When I found out that: 1) There was going to be a lunar eclipse, 2) At a little-kid-friendly time, and 3) Seattle was due for clear skies, I knew exactly how I was going to spend my Sunday night. 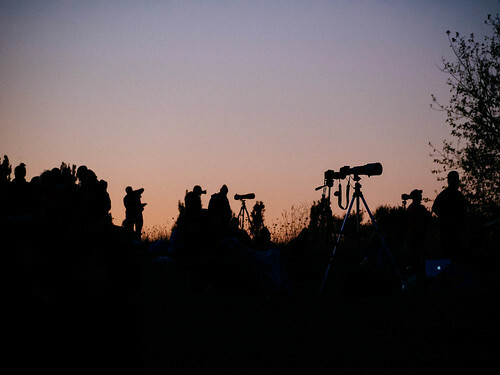 At sunset, we headed with our friends over to Kite Hill in Magnuson Park for its views of the eastern skies over Lake Washington. It turns out that a good chunk of Northeast Seattle had the exact same plan. The hill was full of kids, cameras, and telescopes. It was a casual astronomy party! Seeing the city turn out for an eclipse in numbers I’d normally expect for the Seahawks made me glow inside. However, it’s too early to tell if last night did anything to pass on my astronomy gene to the kids. For them, last night was mostly about running around, playing frisbee, rolling down a grassy hill, flying tiny RC helicopters, and basically acting like lunatics as the sky grew dark. What was happening in the sky didn’t matter at all.